Disclaimer: The intention of this post is not to offer advice on what diet is optimal for your health. I am not a medical or nutrition professional. And though this post focuses on a certain way of eating, it does not in any way imply endorsement of it; the post simply acknowledges that there are those who need or wish to adopt a low-carbohydrate way of eating for whatever reason and that they could benefit from this information. I feel that I need to gather in one place all the suggestions I have made to many of you who have written to me regarding the subject of how to avoid starches, grains, and sugars in Thai food. According to the records, I have written something very similar to this post to at least 30 different individuals in the past two and a half years. And as much as I want to be helpful to each person who has written, I’m too short on time to write individual replies to all the emails asking for the same thing every few days. Therefore, I think this post, a curious blend of altruism and selfishness, is warranted. The number one challenge for low-carbers when it comes to Thai cuisine is the fact that they can’t have rice. This is made more difficult by the fact that the role in which rice plays in the Thai way of eating is different from that in the way Westerners eat in general. Apart from the obvious exceptions (e.g. noodles, desserts, snacks), most Thai dishes are meant to be eaten with rice – even soups and salads. Kap khao (กับข้าว), the Thai word for what Westerners would consider a main dish or an entrée, literally means “(that which is to be eaten) with rice.” And that says volumes about the traditional Thai eating culture, i.e. rice is the main component of the meal and all the dishes are there to accompany it. With rice playing such a central role in Thai cuisine, it’s unimaginable how someone who needs to avoid grains can enjoy Thai food at a restaurant or even at home. You need … something … to eat with Thai dishes which when eaten by themselves would appear over-seasoned. This is because each spoonful of, say, curry is seasoned in anticipation of generally 2-3 spoonfuls of rice. Failure to understand this has often led to an unfair criticism of Thai food as being too salty. But I digress. Let’s get back to the subject. In light of this, one way to make your rice-less life easier when it comes to Thai food is to hold back a little when you season your homemade Thai dishes. Short of that is to find something with which to replace rice. References to the so-called cauliflower “rice” can be found in so many places, on- and off-line, that I don’t know to whom or what source I should attribute this idea. I’d heard of it by way of my older friend, a diabetic who has to drastically cut down on starchy carbohydrates, long before any of the books in which cauliflower “rice” is mentioned came along. I thought it was such a great idea, and whoever first thought this up, my hats off to you. To make cauliflower “rice,” grate coarsely a head of cauliflower – stems and all – and steam it lightly, covered, just to soften it up somewhat and get the raw “green” flavor out. And, behold, steamed “rice” to eat with curries, stir-fries, etc. Based on this, I bet there are many other ways you can use grated cauliflower to mimic “rice.” Make fried “rice” with some raw grated cauliflower, perhaps? My friend M mentioned to me last night that she would love to experiment making fried “rice” with soured pork, naem. That sounded delicious. Now, if any of you out there can figure out how we can create sticky “rice” out of a non-starchy vegetable, please let me know. 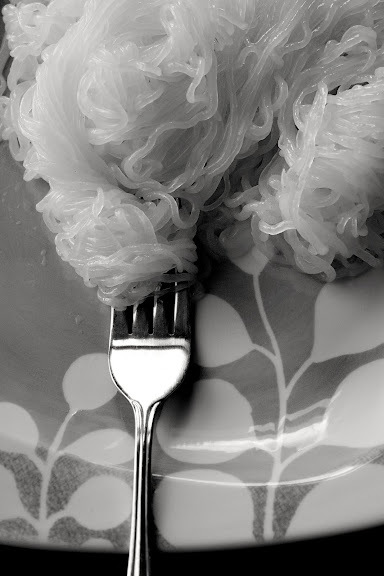 Shirataki noodles could also be used as a substitute for wun sen (วุ้นเส้น), also known as cellophane noodles, mung bean noodles, or glass noodles. I’d be stating the painfully obvious in saying that the translucent, low-carb shirataki noodles don’t taste like rice or mung bean noodles. But I’m sure those who must avoid starches will agree that chewy, squeaky noodles are better than no noodles. *Make Tom Yam, load up on meat and mushrooms, and add well-rinsed and drained shirataki to the soup towards the end. Add some ground roasted peanuts to your noodle soup, garnish it with chopped cilantro, and season the broth to taste with fish sauce, lime juice, and red pepper flakes. Nam Prik Pao has some sugar in it, so if you’re very strict on the carb count, omit it. If not, a tablespoon of the flavorful paste will make each serving of your Tom Yam shirataki noodles so much better. *My friend M has made Pad See-Ew with shirataki noodles. Her verdict: the noodles don’t absorb the sauce as well as rice noodles, but the charred bits in the pan and the caramelized coating on the noodle strands make for an acceptable Pad See-Ew. *Blanch shirataki noodles in boiling water for 1-2 minutes, drain them well, place them in a bowl, and ladle your favorite variation of green curry on top. Garnish with fresh basil. This is designed to mimic Khanom Jiin with Kaeng Khiao Waan (Thai green curry) – a favorite one-dish meal among the Thai. My readers are some of the most innovative people. Chris, a reader from Boston, MA, wrote me a few months ago that he had been making Thai-style fried chicken with no rice flour. He marinates boneless, skinless chicken breast strips as the post instructs, coats them with crushed pork rinds, and deep-fries them until the pork rind “bread crumbs” are golden brown and the chicken strips are cooked through. This trick, says Chris, works best with boneless, skinless chicken that has been cut into pieces small enough to be cooked through in less than two minutes in hot oil — any longer than this, and the pork rinds burn. This means bone-in pieces of chicken that need more time to cook won’t work here. Using a sugar substitute in soups, curries, and salads is, in most cases, easy. This is because it’s simply a matter of omitting the sugar and replacing it with a sugar substitute (and, in some cases, additional moisture) without affecting the end results too much. A salad like Som Tam or a sweet-ish curry like massaman curry, for example, will not be much affected by the use of a sugar substitute. Homemade Sriracha sauce or Thai-style seafood dipping sauce, the consistency of which relies more on pepper pulps than sugar reduction, can also be made easily with a sugar substitute. You just have to experiment with what kind of sweetener to use and how much. Recipes that require caramelization or cooking in syrup, on the other hand, may be hard to replicate using sugar substitutes. Thai sweet chili sauce, which traditionally derives its syrup-y consistency by reducing the water-sugar mixture, will also prove to be a bit of a challenge to low-carbers and diabetics. My recipe, which is based on that used by manufacturers of commercial Thai sweet chili sauce, employs cornstarch as a thickener for a small batch and pre-gelatinized starch for a large batch (pre-gel starch is what manufacturers of the sauce actually use). This results in it being lower in sugar (1/2 cup of sugar for a total yield of 1 cup) than many other recipes. Still, it is a lot of sugar for low-carbers and diabetics. And even if you’ve figured out how to replace the sugar with a sweetener, there’s still the issue of starch-based thickener. This is when you need to consider what you can live with and make a choice accordingly. Without some kind of thickening activity going on, either by reduction or through a starch-based thickener, the sauce will be thin and the pepper-garlic bits will refuse to do anything but floating on its surface. If that doesn’t bother you, simply omit the sugar and starch, and sweeten the sauce to taste with your favorite sweetener. However, if you have a strong preference for a sauce with some body to it, you may want to use a sugar substitute and experiment with a starch-free thickener such as xanthan or guar gum. Things aren’t so complicated with a naturally thick sauce like Thai-style peanut sauce which is a staple of many of us. A few readers have successfully made my mom’s cheaters’ peanut sauce by omitting the sugar, increasing the water to make up for the loss of moisture, and sweetening the finished sauce to taste with their sweetener of choice. 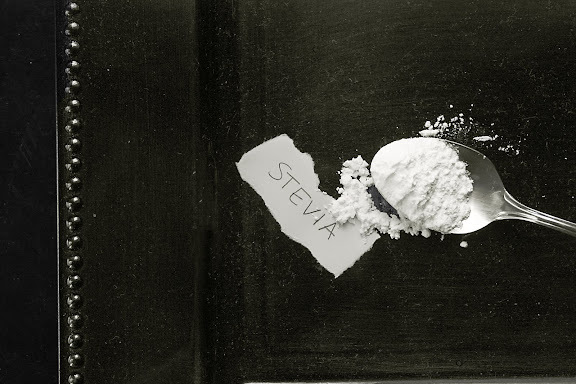 So far, the verdict is that powdered stevia is the best sweetener for the job. Anyone else would like to share more ideas? There are many more; please search the archives. Thank you for this overview of ideas! I hadn’t used the shirataki noodles and am now excited to try them. I’ve used cauliflower many times to make faux-tato salad and mashed faux-tatoes. However, it had never occurred to me to make faux rice! I’ve been eating rice, because I just can’t do Thai food without it, this will help!Your mother’s peanut sauce recipe easily takes a sugar substitute also. These (cauliflower rice and konjac noodles) are both a part of my Thai cuisine repertoire. Excellent low carb substitutes!!!!! Can you help me avoid starches, grains and sugars in Thai cuisine? 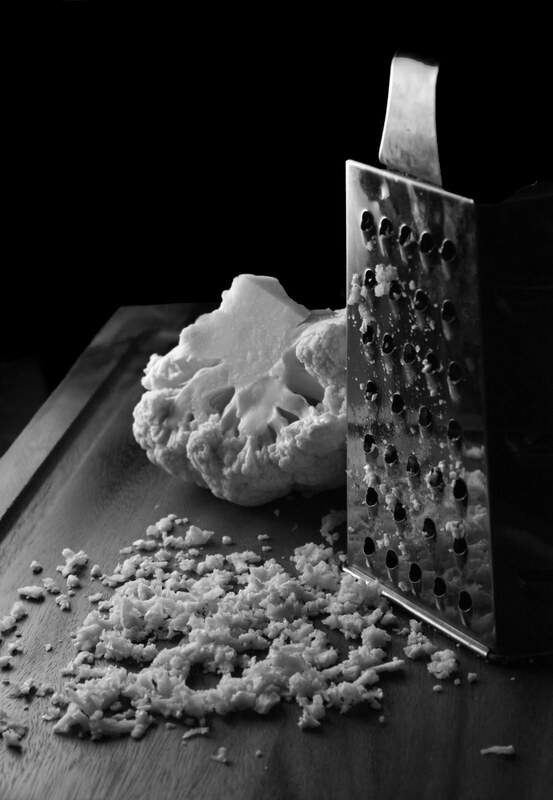 That grated cauliflower idea is fantastic. I bet it tastes great, and is much faster than making brown rice anyway! Great looking site and really helpful info! I’ve been trying to get my hands on some Shirataki noodles here in Thailand, would you happen to know where I would go about getting some? Anon – I believe I have seen block konnyaku at Isetan supermarket at Central World. I can’t remember if the noodle vareities are available as well. But about two years ago, Health & Cuisine magazine featured a few konnyaku (หัวบุก) recipes which included shirataki noodles. So, based on that, I believe the noodles must be available locally. Isetan and UFM may carry them. Shirataki noodles are widely available in all major supermarkets although they do not go by the name Shirataki. If I’m not mistaken, they’re called บุกเส้น (konyakku noodles)in Thai. Leela, my diabetic mother who lives in Bangkok always gets her pad thai without noodles (pad thai mai sai sen). Most stalls gladly accommodate the request. They give you more bean sprouts to replace the noodles. I have to say when it’s done right, meaning when the bean sprouts aren’t overcooked, it tastes very good! Nanda – That’s right! I totally forgot to mention this in the post. Thank you so much for bringing it up. Readers in Bangkok (and other places in Thailand? ), you can order your Pad Thai without noodles. Readers who live elsewhere, check and see if your local Thai restaurant will accept this special request. If they do, support their business and tip well! I make yum woon sen (Thai spicy glass noodle salad) with ground pork, shrimp, and these noodles. You have to boil them a little though, otherwise they’re too chewy. For syrup one may want to check into yacon syrup it’s sweet flavor comes from inulin not sugar. For thickener I wonder if kuzu powder is low carb? A raw food thing to simulate noodles is to use a spirooli or vegetable peeler to make ‘noodles’ from yellow squash or zucchini. If you use the vegetable slicer you can steam the ‘noodles’. During my Thai mother’s last visit to the doctor’s office, she was told that she was pre-diabetic. Sugar? No big deal. No rice? Sent her into a 10-day funk. We’ve been eating most dishes with lots and lots of full lettuce leaf, and have also subbed in grated cabbage. Perhaps you can replicate stickiness with Xanthan gum (see http://www.barryfarm.com/nutri_info/thickeners/xanthan.html). I have not experimented thoroughly yet, but it may have potential. It’s a very strong thickener that’s used in place of corn starch in low-carb diets. I’m glad that you’re making a post on low-carb diets; this gives so much coverage over asian diets that nowadays are currently plagued with extremely high levels of refined starches and sugars. There is a product called “PB 2” (google it) which is roast peanuts, powdered, so that a great deal of the fat is removed. One, as they say, “simply adds water”, and presto! A low-fat peanut butter type product that tastes right in a number of (not every) application. Tasty l-o-w f-a-t PB ! at the Dreamfields site with their mysterious Dreamfield pasta ‘matrix’ . I’m Chinese and pre-diabetic. No rice, it hurts! Agar agar seems to be low carb, it’s for making jelly desserts but I believe it thickens as well. Just need to make sure it is the unsweetened kind. Thanks for this intro to shirataki noodles. I’d never heard of them before, and I’ve made them a regular part of my diet since this article came out. They’re great in soups, and in stir frys, and I add them to an un-soupy curry in place of rice. Works great. Just don’t expect the blood sugar rush that regular noodles will give you, and they’re fine. Lots of different shapes/sizes at http://www.konjacfoods.com. Haven’t actually tried them in a traditional Thai noodle dish, but I think they might be an acceptable substitute even there. Konjac powder – same substance shirataki noodles are made of – also works very well as a thickener, although the techniques are a little different. Joel – Thanks. You may also want to try Korean kelp noodles that have become a big hit among raw foodists. I have never tried them, but believe that, like shirataki noodles, are low cal and low carb. Ah, once again you’ve introduced me to something I’d never heard of. Just got some kelp noodles in the mail and tried them. Flavorless, like shirataki, but instead of being rubbery they are actually crunchy. They are quite strong and not at all brittle, but they have a crunch very similar to mung bean sprouts. In fact, I just made a salad with kelp noodles, bean sprouts and peanut sauce. Really good. A little more expensive than shirataki, but worthwhile. Thanks! I’m not sure about agar, but it’s an idea worth exploring. Pectin for low- or no-sugar jams should work well! My partner enjoys Chinese food, which I cook regularly, but is not keen on rice. One solution I have found is to reduce the amount of salt in the dishes. For example, if cooking beef with broccoli stir fry, instead of marinading slices of meat in the traditional salty mix of soy, rice wine and cornstarch, I might chargrill whole beef ribeye steaks, slice, scatter with julienned scallions, and serve with a soy, ginger and chili dipping sauce, atop a mound of steamed broccoli dressed with sesame oil and a LIGHT sprinkle of Maldon sea salt flakes. If you go easy on the dip, it’s considerably less salty than a regular beef and broccoli stir fry. Is the dish still Chinese? Purists would likely say not. Yet, the meat has a pleasantly seared exterior (ticks the ‘wok hei’ box); the pairing of beef with broccoli is classic Cantonese, and the all-important soy-ginger-scallion trinity is there. What’s more, the taste is less greasy and cloying (no cornstarch, beef is dry-fried on outer surface only) than a typical Chinese stir fry, so you do not need to eat a ton of rice with it. Anyway, I digress. My point is that eating or cooking a particular cuisine in a non-traditional way is not necessarily A BAD THING, and sometimes, serendipitously, the result is some tasty if inauthentic nosh, so don’t despair if you have dietary restrictions. Now, I would really know how to make Thai food with a peanut-allergic family member! I find cashews and cashew butter to be the best peanut substitute in Thai dishes. In some dishes, cashew is tolerable; in some dishes, like salads, it’s actually an improvement. Thanks, but unfortunately he’s allergic to all nuts. Would pine nuts (not actually nuts, but seeds, although peanuts are not nuts either, they’re legumes) be an acceptable substitution? I’ve never used pine nuts in Thai food, so I can’t say. My instinct says they won’t taste that great in a lot of things. In a salad, maybe. But I don’t see them in other things. If seeds are okay, you may want to explore other seeds with milder flavor: sunflower, pumpkin, watermelon, etc. Not that these necessarily are ideal peanut subs, but they represent options that are comparable to, or slightly better than, pine nuts. Hi guys you could also try the new low carb Slimpasta range, my father is diabetic and loves pasta in all forms both thai and italian but being a diabetic you have to limit your carbs to keep controll of your blood sugars and this has been a godsend for him. Website is http://www.slendierslim.com.au/ and you can get the pasta in few types at the local supermarkets here in Australia, not sure about elsewhere but maybe you can buy online if its not available locally for you.